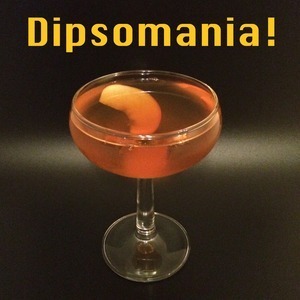 25 episodes of Dipsomania! since the first episode, which aired on September 13th, 2015. Jake and Lance invent cocktails to pair with the films F8 of the Furious and Atomic Blonde. Jake and Lance spend some time with a New Orleans classic that combines rye whiskey, cognac, sweet vermouth, a touch of Benedictine and both Peychaud's and Angostura bitters. In this episode Lance and Jake are taking you to Italy and setting you up for summer as we explore the Americano. Jake and Lance get crazy with the green stuff, as they investigate the Last Word and its many variations. Lance and Jake finally spend some time with the spirit they love to deride. They mix up some vodka cocktails and discuss whether it was worth the effort. Jake and Lance mix up cocktails with Scotch whisky and discuss the merits of doing so. Also, since this episode was recorded during the holidays, we also spend time talking about overt consumerism, travel plans, and even politics and altruism. Lance and Jake talk about the resurgent classic occupying the space between the Manhattan and the Negroni: The Boulevardier. They also talk about the World’s 50 Best Bars list and deal with some nearby jet traffic. Jake and Lance shake up daiquiris and discuss the ins and outs of the rum and lime classic. Lance and Jake stir up the most classic of classic cocktails, the Old Fashioned. Jake and Lance explore the wonders of gin combined with quinine tonic. Jake and Lance explore the Negroni, that bright red Italian bitter drink that makes them both so happy. Plus Beyoncé and other topics.